The smallest of bathrooms can be ‘WOW’ and functional and luxurious if this is renovated with the apt planning. This is, no doubt, considered as one of the toughest renovations, but getting a choice of professionals who are not only qualified but also experienced makes this process much simpler. It is wiser to get this designed by a professional and make a list of all the different types of people you will need to renovate your bathroom, like an electrician, plumber, Mason and so on. Working out a plan with the said designer and the other workers makes this project more realistic. It is advisable to decide your budget before starting the work. Some small tips can work out extremely helpful if this bathroom renovation project is undertaken. Take each detail into consideration and contact the professionals. You get a fair idea of how the bathroom will function and how will it look like. Spending on professionals is a sensible step as you may not renovate your house every day. Decide on the tiles keeping in mind the ‘easy-care’ factor. Glazed or porcelain tiles can work apt for the low maintenance factor. Eliminate the idea of opting for the stone tiles which are porous, like limestone, as they tend to absorb spills and drips easily. In case, you make this choice you need to ensure that the sealing is done right. Wiring needs replacement if this has been used for a long period of time. Most bathroom renovations planned to tend to overlook this factor. This might work out dangerous due to short circuits or other electrical problems. There are different types of sinks available like the pedestal sink, vessel sink and so on. Decide on the specific sink which fits your requirement. Plan out the storage as this gives the bathroom a neat and ‘no clutter’ look and feel. 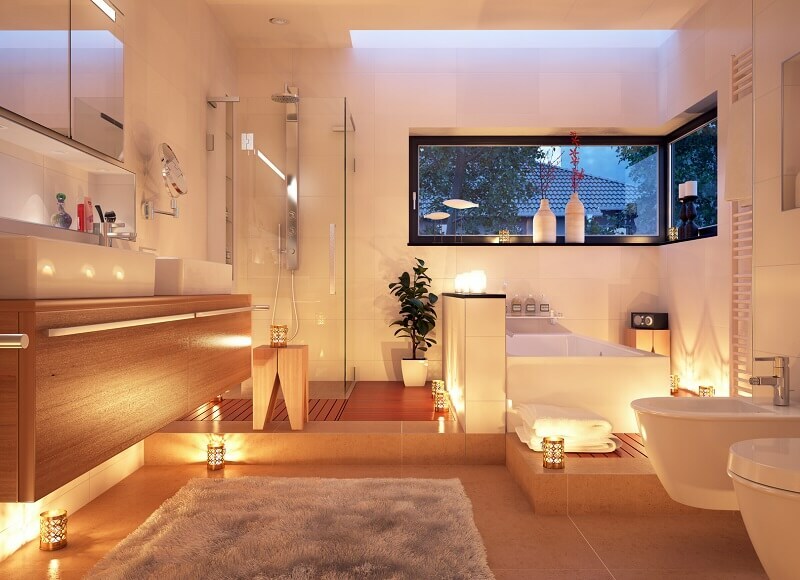 You can opt for decorative lighting even for the bathroom. The bathroom was not given its due importance once upon a time, but with the changing times, you see bathrooms as places which are well decorated and appropriately lit up. This is one place where you can get your ‘me time’. You might want a simple design for your bathroom, and spending a wee bit extra on hi-fi materials is no sin. You need to remember that luxury comes at a price. Think of the many benefits you are offered when you opt for a bathroom renovation. This will help you loosen your purse strings to opt for this change in your home. With changes made in your bathroom, you find that you save on energy bills. Most appliances available these days take energy efficiency as an important factor. The water heater or any other appliance required in the bathroom can be bought keeping this factor in mind. Eliminating all that is not required can lead to a more spacious bathroom, which is anytime a preferred choice for a homeowner. Repairing and replacing the tiles, sinks, and wiring is an option for a bathroom which is cleaner and tidier. With all the leaks taken care of, you enter a clean bathroom. Finally, a bathroom renovation tends to increase the value of a home. Reselling gets easier as you tend to get the price you want. You can ask around for professionals from family and friends and compare two or more so that you are benefitted to the maximum. A little trouble taken can go a long way in offering you the bathroom of your choice.